To most people, the knowledge of the Romans was that they "invented central heating." Not the type we know today, but a form of underfloor heating that also warmed the walls. There were no such items a radiators in the Iron Age, but they did manage to use a form of heating that was radical for it's day. Up until the Romans arrived, the British only knew how to heat one room by using a fire. The danger from such a method of heating was not only due to the materials in their homes, but also from the smoke that could become trapped and suffocate the dwellers through smoke inhalation. To understand how the Roman system of heating worked, take a look at the photo left which is from the Roman villa at Newport, Isle of Wight. Here you can see where the floor was laid out as series of concrete slabs raised up on tiles, with a furnace at the bottom of one exterior wall. By placing the fire here, the draught would take the heat under the floor, and up through the walls to chimneys located in the corners of the room. The height of the stack of tiles was about 2 ft (60 cm) as this was found to be the most efficient height for the air to travel through. Once the air had passed under the floor, the air was drawn into the walls and up the flues by the action of the hot air already rising in the flues creating a partial vacuum and so pulling the air below into the walls. The walls were very often made of bricks with two holes horizontally through them. This had the effect of passing the air through the walls and into the flues, thereby warming the walls also. In the Roman baths, the furnace was placed next to the hottest room caludarium in which three walls of this room were heated so that the room reached a temperature of up to 120 degrees F (50 degrees C). The warm room tepidarium only had one wall heated which made this room cooler than the caludarium. The heating system was a labour intensive device as it required constant attention to feed the fire and remove the ashes. As such it was the wealthy and those with influence that could afford to have it. The furnace was the heating source of the system and this was placed on the outside of the house, below the floor that ran under the room that was to be the hottest room in the house. One room was always hotter than he rest, as the air flowing under the floor would naturally lose some of it's heat as it was traveling under the floor. The fire would need regular attention from a slave, or one of the household workers who would have to rake out the ashes with a long handled tool and use the same tool to push new fuel into the fire. The fuel was mainly small branches and twigs up to about 3 inches in diameter and up to two feet long which was placed 2-3 feet into the furnace opening. This was allow the air to be drawn in and around the wood and so make sure the air flowed freely. Logs were not used as these burned too slowly to be effective and too many would block the passage of air. The height of the fire was restricted to around half the height of the opening so that air could flow through the flames and so increase the heat output. This was essential in the baths were the maximum amount of heat had to be generated. The hypocaust is one of the most ancient forms of an HVAC system. Like many great innovations, it originated with the Romans over 2000 years ago. A hypocaust is both a primary system and a secondary system, as it creates heat and distributes it as well. 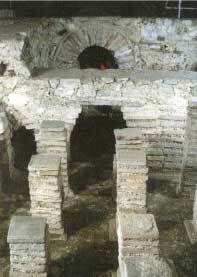 The main use for hypocausts was found in the large public bathhouses. Sauna rooms were created by adding a pool of water, heated by the same fire heating the air below. This created a hot, humid space to clean oneself and converse with friends. The temperature could have easily reached 100 degrees Fahrenheit and the humidity could have reached 100% due to the pools. These parameters are not exact, as the system has not been used is many, many years. Its purpose was to evenly heat the room in the most efficient way possible. A hypocaust was composed of a raised floor (typically about two feet), supported by columns or pedestals of stone every few feet, with the space below left open. A furnace, composed of a continuously burning fire, created heat, which was then allowed to flow through the space below the raised floor, thus heating the floor and rest of the room. Once cooled, the air escaped through flues in the wall and out of vents in the roof. The furnace takes up a fair amount of space, so it was usually located in a separate room. The flues were built directly into the walls so they did not take up useful space. Connecting the aqueducts (which brought water into the city from the mountains), water tanks and pools were a series of tunnels. These were constructed of brick and mortar (very crude for today? ?! "s standards, but they obviously worked). Like the water system, the air flow system was connected by ducts, consisting of stone or brick tunnels under the floor, into the large open space beneath the raised floor, and into the wall flues. These flues also provided a source of insulations for the room. The hot air rising created a barrier, keeping the warmth inside the building. As mentioned above, the typical materials used in this system are stone, handmade brick and mortar. An early form of concrete may also have been used, as the Roman had used it for many other buildings of the age (for example, the dome of the Pantheon). Due to the second floor and pillars, this was difficult and laborious to construct. Costs were much higher than a simple fireplace due to the larger amount of materials used. 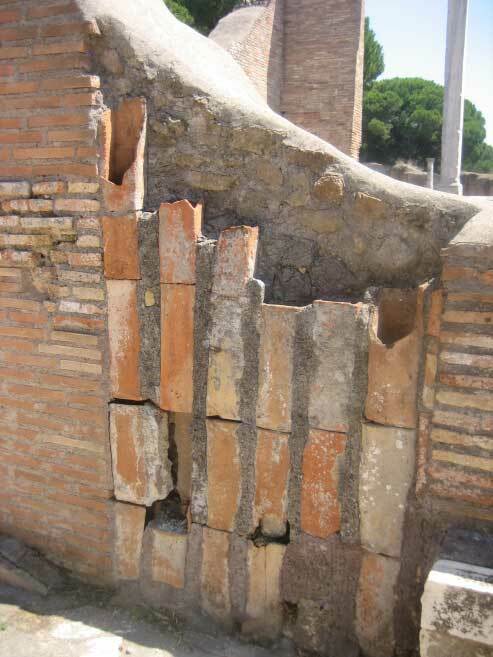 The main disadvantage of the hypocaust system is a very dangerous one. The fumes created by the fire in the furnace easily crept out of the holding space below the false floor and into the main space. This silent killer is now known as carbon monoxide. Although it is easily detectable and preventable today, the Romans probably had no idea of this concept. 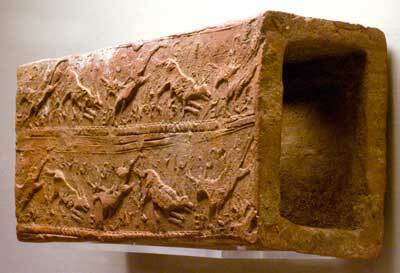 Hypocausts were used for heating hot baths (thermae), houses and other buildings, whether public or private. The floor was raised above the ground by pillars, called pilae stacks, with a layer of tiles, then a layer of concrete then another of tiles on top; and spaces were left inside the walls so that hot air and smoke from the furnace would pass through these enclosed areas and out of flues in the roof, thereby heating but not polluting the interior of the room. Ceramic box tiles were placed inside the walls to both remove the hot burned air so to heat the walls. Rooms requiring the most heat were placed closest to the furnace, whose heat could be increased by adding more wood to the fire. 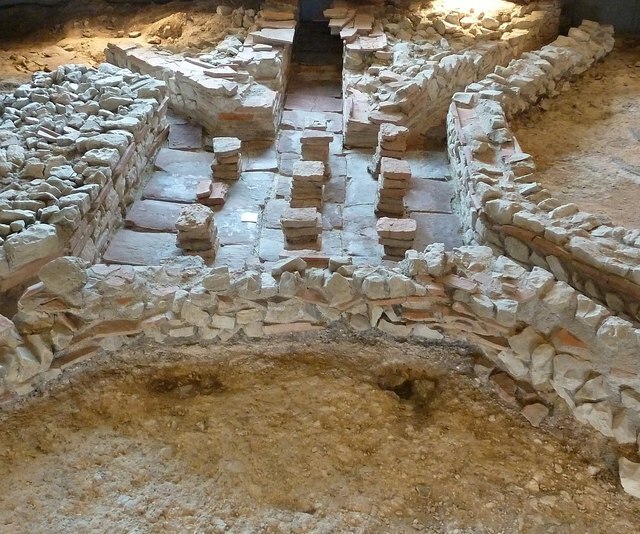 It was labour-intensive to run a hypocaust as it required constant attention to tend the fire, and expensive in fuel, so it was a feature of the villa and public baths. Vitruvius describes their construction and operation in his work De architectura in about 15 BC, adding details about how fuel could be conserved by designing the hot room or caldarium for men and women to be built next to one another, adjacent to the tepidarium so as to run the public baths efficiently. He also describes a device for adjusting the heat by a bronze ventilator in the domed ceiling. Many remains of Roman hypocausts have survived throughout Europe, western Asia, and northern Africa. The hypocaust was an invention which improved the hygiene and living conditions of citizens, and was a forerunner of modern central heating.